Their natural diet consists primarily of a wide range of different fruits; thus they play an extremely important ecological role as vectors for seed dispersal of fruiting trees. 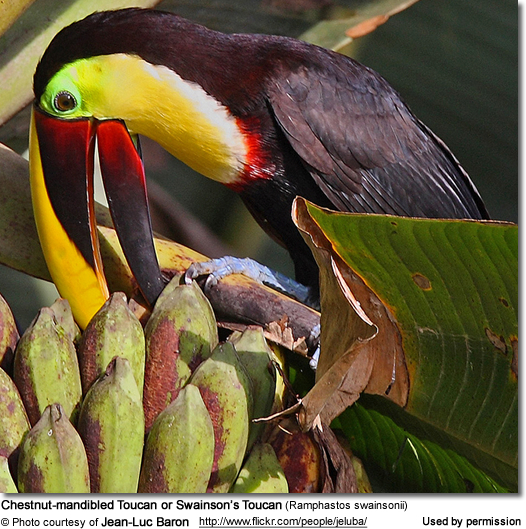 Toucans get most of the water they need from the fruits they eat. Although captive birds need access to fresh water at all times -- especially since their diet includes pellets. They also require opportunities for bathing. In the wild, they will also feed on bird eggs and occasionally small animals (including smaller birds and their nestlings, lizards and other small prey). During the breeding season, in particular, they will take large amounts of insects for protein. 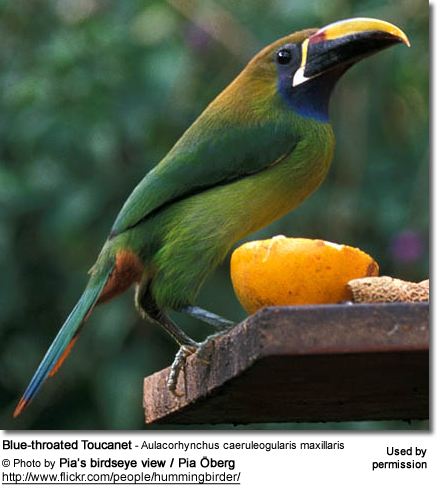 Members of the toucan family are thriving on a diet of high-quality, low-iron pellets and fresh fruits. Pellets should make up about 50% of their diet - the other half being fresh fruits. They should be fed plenty of fresh fruits, such as papayas, cantaloupes and other melons, berries, grapes, apples and bananas. (Papayas in particular are amongst their favorites.) The fruits should be chopped up into bite-sized pieces (about 0.5 inch on each side). Any seeds (such as found in papaya or melons) should be removed as they can cause intestinal problems. 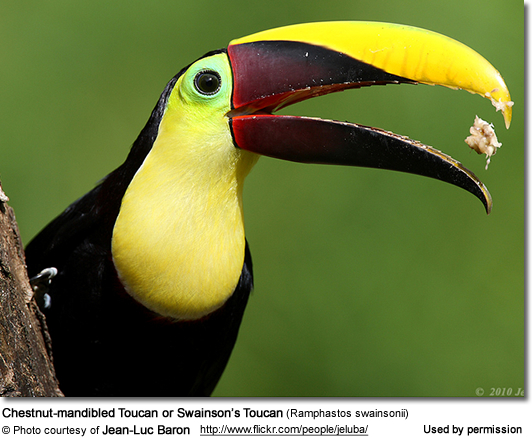 Toucans have frequently been observed throwing their heads back when eating small fruits, allowing the fruit to roll into their throats before swallowing. Please be aware that certain dietary components may increase the storage of iron, including Vitamin C, ascorbic acid (citrus fruit) and sugar. Their liver accumulates too much iron resulting in iron storage disease, which is a common and serious health problem with toucans. Since citric acid facilitates the absorption of iron, Jerry Jennings, President / Director of Emerald Forest Bird Gardens strongly recommends "against feeding any citrus fruit at all - not even in moderate amounts." Fruits high in citric acid are, for example, oranges, lemons, grapefruit, pineapple, limes and tomatoes. If Mazuri isn't available in your area, a good quality formulated (low-iron) softbill food (in addition to plenty of fresh fruit) should be fed. It is important that the formulated diet does not contain propylene glycol - a liquid derived from natural gas that is used in antifreeze and de-icing solutions, as well as skin-care products. Unfortunately, it is also added to many formulated pet diets (birds, dogs, cats). This chemical can cause serious and potentially irreversible health conditions, including death. The pellets and fruits should be offered in separated dishes twice a day. It is important to wash the dishes very carefully before each feeding, as bacteria grow quickly in this high-sugar and moist environment. It is easiest to have several sets of dishes, place used dishes into the dishwasher for cleaning, and use fresh sets of dishes for each feeding. During the breeding season, crickets are typically added to meet their increased need for protein. Seeds should not be fed as their digestive tracts are not designed to digest seeds. 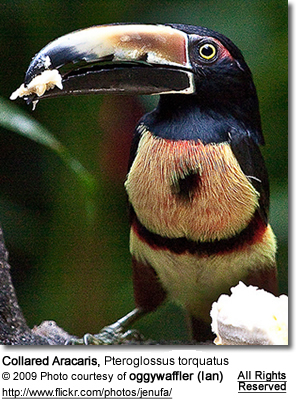 Toucans will lose weight and eventually starve to death if kept on an all- or mostly seed diet. Note: Birds that are fed a formulated diet do not need supplementation with vitamins. Excess nutrients (particularly synthetics) can be harmful to their health. Keep a fresh, clean source of water available for your toucan at all times. Many toucans will use this dish primarily for bathing, but they do drink from time to time as well.